When it comes to fighting disease, bacteria do it better. When it comes to fighting disease, bacteria do it better. Not just antibiotics, but immunosuppressants, anti-fungal creams, some drugs for malaria, and many anti-cancer agents come from compounds made by bacteria. Shank pulls up an electron-microscope image of a grain of sand, blown up so large you can see individual bacteria crawling on the surface. There might be thousands of bacteria living on one grain of sand. What happens when they’re packed in so close together? 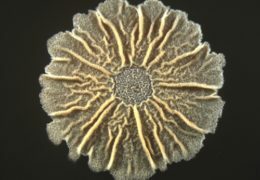 Bacillus subtilis, grown for four days on a biofilm-inducing agar medium at 30° F.
For years, scientists have described bacteria as making weapons to fight each other. A better analogy, Shank thinks, would be bacteria sitting in a crowded waiting room. “What happens in a waiting room? You talk to the person next to you. You overhear someone else’s conversation. You smell someone’s lunch, and then you get hungry. 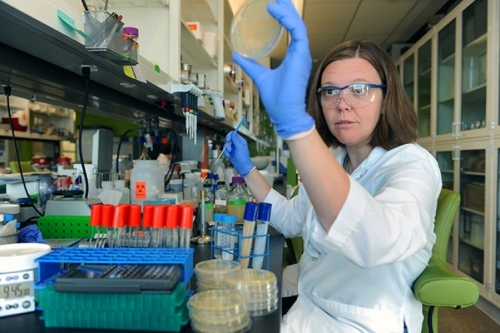 All of that is a lot like what goes on the microbe world,” she says. Shank thinks that once we understand how bacteria use chemical compounds to communicate, we’ll be able to step into the conversation. Instead of wiping out bacteria en masse with antibiotics, we’ll tell bacteria to stay or go, quiet down or wake up. And her lab has started learning some of these basic commands. Scientists haven’t noticed these more peaceful microbe messages because they’ve been looking for signs of violence, Shank says. In the quest for more and stronger antibiotics, drug companies threw large amounts of different compounds at bacteria to see what would kill what. By 2014, we’ve learned that the widespread use of antibiotics breeds more and more dangerous bugs. Dangerous bacterial infections have always been around, explains UNC School of Medicine researcher Rita Tamayo, but in the past 20 years they’ve become much more common. There are several infections patients often get in hospitals, with C. difficile and methicillin-resistant Staphylococcus aureus (MRSA) being the most common. “C. difficile has picked up even more with the appearance of so-called super-virulent strains—epidemic strains that seem to be better adapted to the intestine, or for causing disease, or producing more toxins,” Tamayo says. So Shank thinks it’s time to take a subtler approach than finding bacterial compounds to kill other bacteria. Since she came to UNC in 2013, she’s been throwing bacteria together in different combinations to see what happens when bug A, bug B, and bug C are packed in a small space together. Yes, sometimes they’ll just start trying to destroy each other. But a lot of times, the relationships between bugs are more complex. She and Shank are searching for bacterial compounds that have this effect, because they might be the key to preventing, or curing, some of the nastiest gut infections. “Say you get a massive dose of antibiotics,” Shank explains. “C. 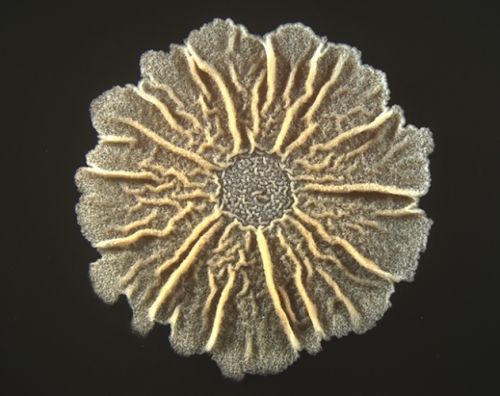 difficile can form spores, so it survives the antibiotics by going completely dormant. Normally your good bacteria would fight it off, but all your good bacteria have been killed by the antibiotics.” When those C. diff spores wake up, they cause life-threatening infections. After researchers learn how to use compounds to make bacteria form spores, someday we may be able to put those compounds in a drug to tell bugs like C. diff to keep hibernating until the good bacteria come back. Or we could use a compound to make bad bacteria come out of the spore state, making them easier to kill. To get from a bacterial compound to a drug, first you need to figure out how to make a lot of the compound, says Scott Singleton, a researcher in the UNC Eshelman School of Pharmacy. Then you must show that the compound will do the same thing in the real world that it does in the lab. Then comes the third, most important step: making sure the drug is safe for humans. “Very few big pharma companies do research, development, and sales—the whole soup-to-nuts of drug production,” Singleton says. Most drug-discovery work on antibiotics now goes on in small biotech companies such as his own startup, Synereca. “Our approach is to look for molecules that make antibiotics more effective, so that bacteria that are becoming resistant can be killed again, or so you can take an antibiotic at a lower dose that doesn’t kill bacteria so indiscriminately,” he says. Beyond taking drugs, scientists want to use bacterial products as coatings outside the body. In hospitals, for example, bacteria on catheters are one of the major sources of infections. It’s hard to keep catheters clean, but a coating of a compound that tells bacteria not to stick could help. Or, Shank says, imagine deliberately coating a catheter with harmless bacteria to crowd out the bad ones. Or think of your teeth—plaque is a buildup of bacteria, some of which produce acid that eats away tooth enamel. A bacterial compound could signal the acid-making bacteria not to stick, so that they get rinsed or brushed away. Scientists tend to grow bacteria in isolation in the lab, and the bugs probably make their full library of compounds only around other bacteria, Shank says. So she’s busy culturing different bugs together in the lab, to see what they do in close proximity to each other. What are all those extra compounds? They could be anything, Shank says. The next great antibiotic, the next anti-cancer drug. We won’t know until we look. Elizabeth Shank is an assistant professor in the Department of Biology in the College of Arts and Sciences at UNC. Rita Tamayo is an associate professor in the Department of Microbiology and Immunology in the UNC School of Medicine. This research is funded by the National Institute of General Medical Sciences in the National Institutes of Health. The work finding previously unknown bacterial compounds is a collaboration with the lab of Albert Bowers, an assistant professor in UNC’s Eshelman School of Pharmacy. Scott Singleton is an associate professor, also in the Eshelman School of Pharmacy. This entry was posted in Earth, Health. Bookmark the permalink.